There’s suddenly a storm of outburts about a week-old interview that George Lucas had with Charlie Rose. It’s the one where he compared selling Lucasfilm to Disney as selling his children to “white slavers.” This was a stupid thing to say, but not really a new note for Lucas to hit. For a while, word had it that Lucas was going to be consulting on The Force Awakens. 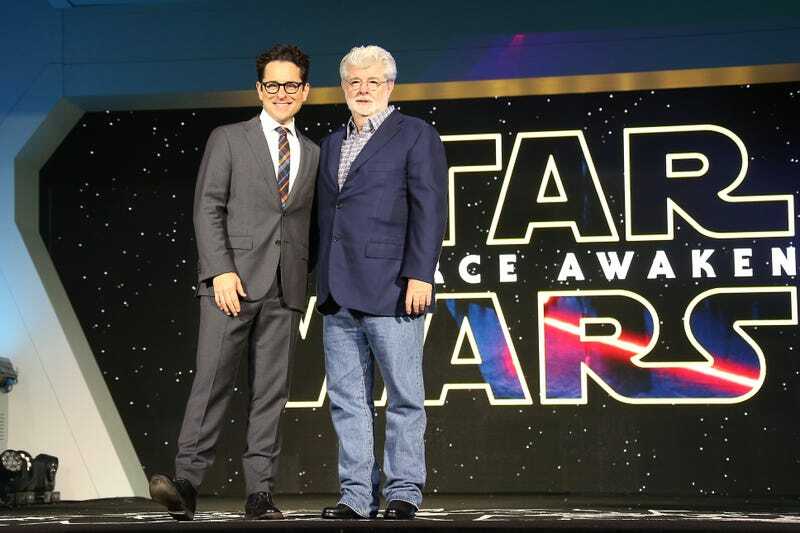 His son, Jett Lucas, said back in 2013 that Lucas created a set of guidelines for the sequels and was “constantly talking” with J.J. Abrams. But then, according to Lucas, Disney “decided they didn’t like” his plots for the new trilogy, and he walked away. I haven’t seen anything; I mean I saw the trailer, it looks great, it looks interesting. But as I’ve said before: one thing I regret about Star Wars is that I never got to see it, you know? I never got to be blown away by the big ship coming over the thing, or anything. But this time I’m going to be, because I have no idea what they’re doing. That was optimistic and nice George, who faded away the closer The Force Awakens got to actually being released. The issue was, ultimately, they looked at the stories and they said, “We want to make something for the fans.” So, I said all I wanted to do was tell a story about what happened. Lucas seems under the apprehension that making a film fans would love necessarily means that it wasn’t going to tell the story. In another interview, this time published in The Washington Post on December 5, Lucas said that you either have complete control or you don’t, and looking over J.J. Abrams’ shoulder was going to make them all miserable. “So I said ‘I’m going to get divorced,’” Lucas explained. Which all sounds very much like Lucas was regretting the whole endeavor, but had no choice but to try to enjoy it now. Or, at least, not ruin it for everyone. Given that Lucas hasn’t been a fan of fan reaction in a long time, it’s hard to read that as a good thing. And note that he didn’t actually say that he liked it. Lucas: These are my kids. Rose: All those Star Wars films. Rose: They were your kids? Rose: And you sold them. How incredibly offensive. Yes, selling your film and production company for four billion dollars—especially when you already had buttloads of money—and then not liking what the new owners do is exactly like being forced to sell your children into slavery. That’s not really how it seems. It seems like, with the comparisons to a divorce and children and, you know, slavers, Lucas does find it all painful. And he’s grown more pissed about it over time, not less. In a weird way, people liking Disney’s Star Wars is the worst possible outcome for him. No one’s ever made the case for a giant corporation taking over for the original artist as well as George Lucas. Which probably isn’t what anyone had in mind. Update: Lucas has now apologized for the “white slavers” thing and said some very nice things about Disney.